This article seeks to expand the scope of our understanding of values and their connection to the work of poverty lawyers. The article explores the literature on poverty and moral worthiness. In order to bring clarity to the discussion, it examines social science research on defining "values" and detailing how they can affect behavior. Prof. Jacobs describes the reactions of clinical students to a classroom exercise, which asked them to describe the legal representation they would provide to hypothetical clients. This article describes how the link between students' values and broader societal beliefs affect the practices of the bar and discusses the proposition that the legal community will continue to see the poor as unworthy of full legal representation until society can envision the poor as part of our moral community. 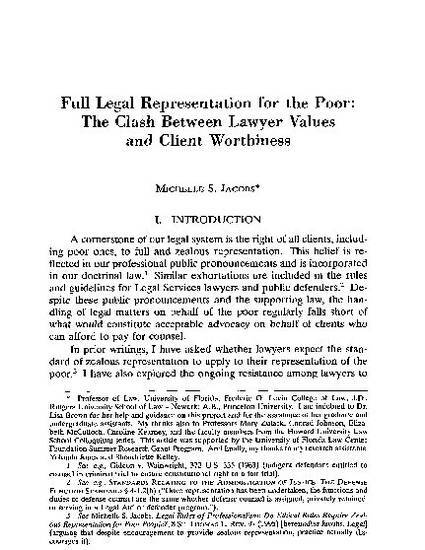 Finally, Prof. Jacobs offers suggestions for fuller studies into whether poverty itself encourages lawyers to temper the quality of representation given to the poor.